Of all the dishes in Louisiana cooking, gumbo is the most famous and, very likely, the most popular. Gumbo crosses all class barriers, appearing on the tables of the poor as well as the wealthy. It is often cited as an beautiful example of the melting-pot nature of Louisiana cooking, but finding a definitive answer to the origins and evolution of the dish is highly speculative. The name derives from a West African word for okra, suggesting that gumbo was originally made with okra. The use of filé (dried and ground sassafras leaves) was a contribution of the Choctaws and, possibly, other local tribes. Roux has its origin in French cuisine, although the roux used in gumbos is much darker and richer. Here is my personal Gumbo recipe. 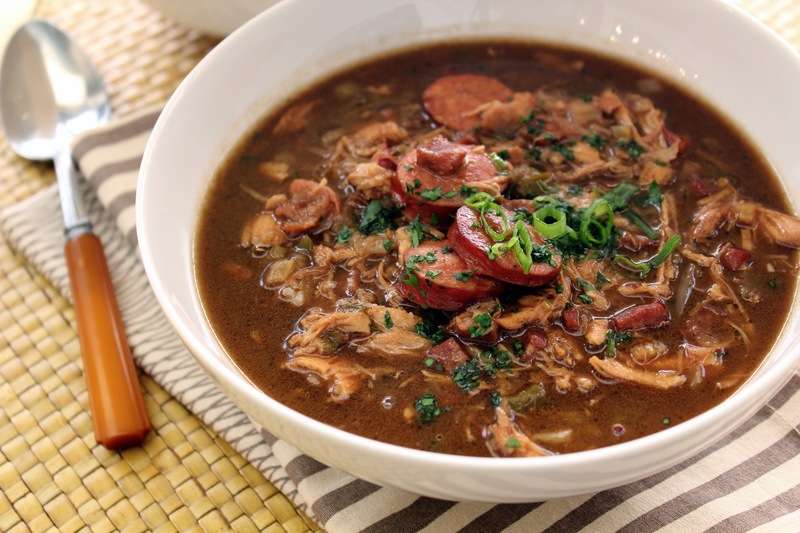 I’ve made this gumbo with everything from venison to pheasant and the depth of flavor makes it a hit every time. I’ve worked on this recipe for two years before settling on this combination of ingredients. Feel free to be flexible and creative with the proteins you use- however make sure they are seared and browned well before they are added to the gumbo. If you need to save time, a rotisserie chicken works great. This is unpretentious and delicious meal that I make to get a taste of Louisiana wherever you live! Season the chicken pieces generously with the Cajun/Creole mix. Sear and brown chicken pieces evenly with one cup of hot oil in a large heavy-bottomed pan. After a few minutes, add smoked sausage. Remove all meat from pan and shred chicken once cool. Make a roux by mixing one cup of flour into the oil that was used for the meat. Blend thoroughly in a thick skillet and cook over medium-high to high heat, stirring constantly with a wooden spoon. Cooking roux requires your full attention! If you start to see black specks in the roux, it has burned and you’ll have to throw it out and start again. Keep cooking and stirring until the roux gets darker and darker. I like to make my roux medium- a few shades darker than peanut butter. When the roux is finished, will have an earthy and nutty smell that is reminiscent of roasted coffee. It should take around 15 minutes to make the roux. Stir onions, okra, garlic, pepper, and celery into the roux. Lower the heat to medium-low and continue stirring until the roux turns a glossy dark brown, about 10 minutes. Next, add the stock, thyme, and bay leaves and simmer for at least 30 minutes. Season lightly with Cajun spices and salt/pepper. Add the chicken and andouille sausage. Simmer lightly for another 15 minutes. Skim the gumbo before serving with fluffed white rice. Garnish with hot sauce and file powder.